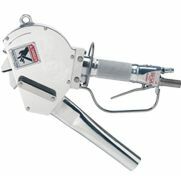 The Jarvis Model SHC-165G — hydraulically powered spinal cord remover for beef or pork. Latest patented technology for grinding away BSE risk material, including the spinal cord and the meninges (spinal cord skin). Connected to a vacuum system that collects removed spinal cord material for disposal. Lightweight, powerful (2.5 hp) hydraulic motor- no bogging down or motor icing; low noise and instant stop. Heavy duty gears made to withstand the extreme condition found in larger meat processing plants. Rugged construction provides unsurpassed durability.